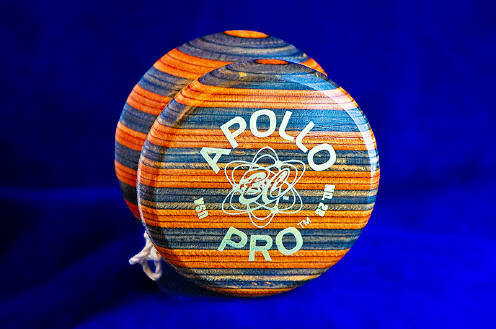 Pristine, unused Yo-yo's are of little interest to me. My collection consists of many that date back to the 50's and they were used as they were intended, as toys. Made from genuine Hard Rock Maple, the "jeweled" tournament, among serious collectors, is one of the most popular yo-yos in the world. The jewels are from the Austrian crystal factory used by Duncan in the 1950s. 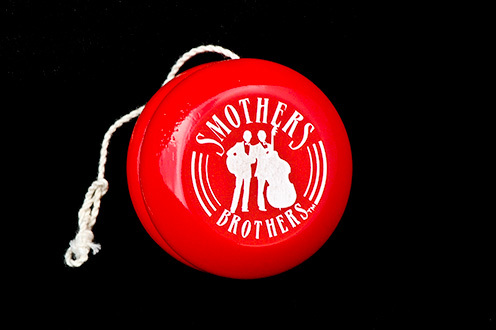 This particular Yo-yo was purchased in 1953 for Catherine Horne. It is the best known and easiest to find of the wood Duncan jeweled Tournament models. Original Duncan Jeweled Tournaments have sold for over $400 and a full display box of them sold for $4,100! Duncan has re-introduced a "vintage" version of this model but there is nothing like owning an original. Duncan made quite a few different Tin Whistlers over the years, up until around 1955. Tin whistlers were metal yo-yos. An inner and outer tin shell made up each half, and halves were attached with a metal axle. Large holes, almost 1/4 inch in diameter were placed on the outer edges of the yo-yo halves. 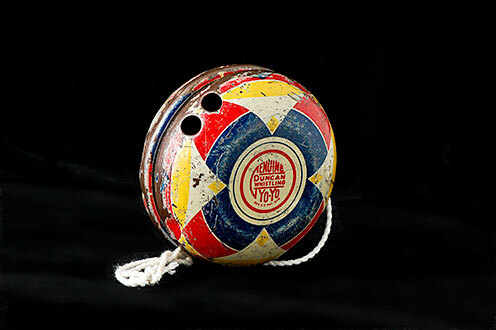 As the yo-yo spins, air rushes thru the holes creating a whistling/humming sound. Generally, two holes were placed on one half of the yo-yo and four on the other side. This created two different frequencies, so as the yo-yo slowed it's spin, the sound would switch from one tone to the other. Logos were lithographed on the tin, usually with patterns like this one. 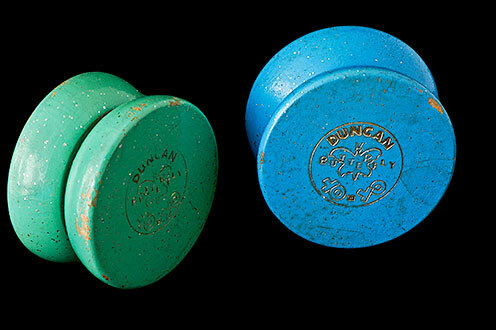 Many of these were made for Duncan by the Cayo company, which also had it's own line of whistling tin yo-yos. These are difficult to find in good shape. They were much loved by their owners and passed down the generations. Rust is common, and the tin dented easily on impact. Values on these models can be up to $400. Propeller Whistler, Part of Duncan's Litho Whistler "Second Series"
This one dates from 1935 when they were retailed out of a counter display box. They were packaged 12 to a box and sold for 15 cents each. The stocking number was 88. This has a dime size lithograph seal first released in 1932. It was the first of the Duncan musical yo-yo's and is smaller at 1-3/4". Valued at $50. The wooden concave was one of the most popular models towards the end of the old Duncan period before 1965. The ones pictured here are the first standard line Butterfly. 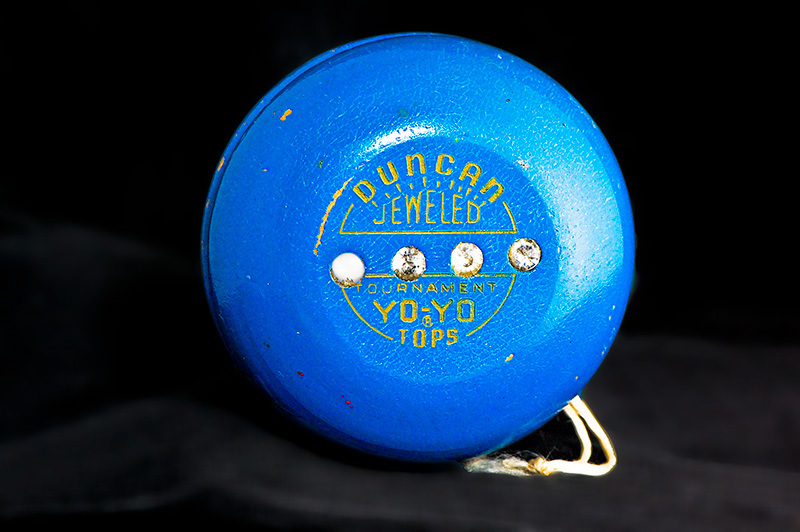 In 1965 Duncan lost the patent to the name Yo-Yo and went into bankruptcy. They did retain the rights to the name "Butterfly" and are still producing a plastic model today. 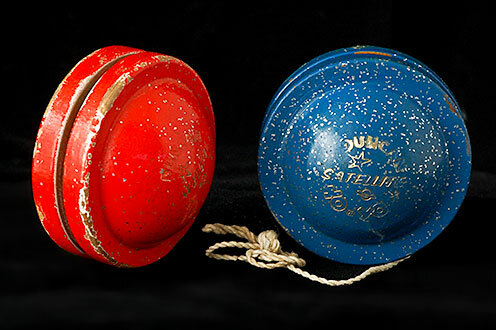 In 1968 the Flambeau Products Corporation bought Duncan and being a plastics company, ended the golden age of the wooden Yo-Yo. Most Butterfly concaves were painted with a glitter paint like these. These were retailed both on display cards and loose out of counter boxes. The original price was 69 cents. Display cards we marked Stock No. 707 or Stock No 707B. In the 1958, Russia launched Sputnik, the first satellites to be placed into orbit. In Norman Oklahoma, I stood on my front lawn with my brother and sister and watched it move over our heads. Duncan capitalized on that event and this became one of their most popular models after it was introduced in 1960 at the New York Toy Fair. The end of the Satellite series came in 1965 with the closing of the Duncan plant. There were several variations of the original Duncan Satellite. Pictured here is the round sided version of the satellite though some were made flat on the sides. The lettering on the round models rub off more easily than the flat sided models. Satellites retailed for 69 cents loose, on display cards and in polybags with saddle header cards. Duncan has released a retrospective version of this model but the ones pictured here are original. 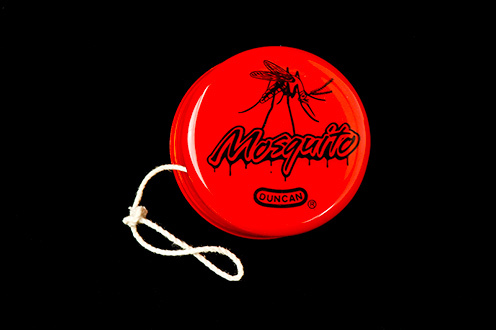 The Mosquito is a small and light bearing concave model. Made to break the $10 price point in the Duncan line, while still providing high performance. Interesting construction. Outer body is opaque, while the inner body is translucent. While it was shipped with friction stickers, under the stickers was a starburst response. So this one could be played with friction sticker response, starburst, or a combination. An atypical model made in China during 1998. 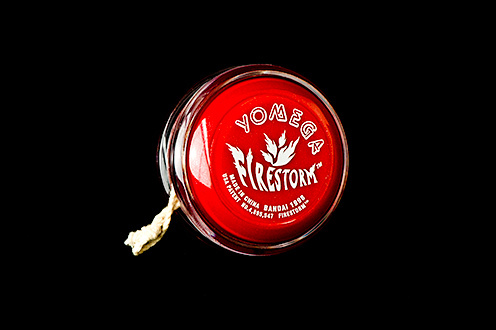 Released in 2009, this is yo-yo is engineered for the advanced player. 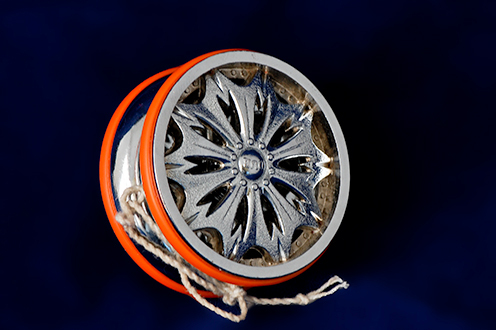 This high grade, all aluminum yo-yo has a weighted perimeter, a stainless steel abec 5 bearing (size SMR126ZZA5), a new super smooth rubber return system, laser etched print, and a adjustable gap spacer system. Made in limited quantities. 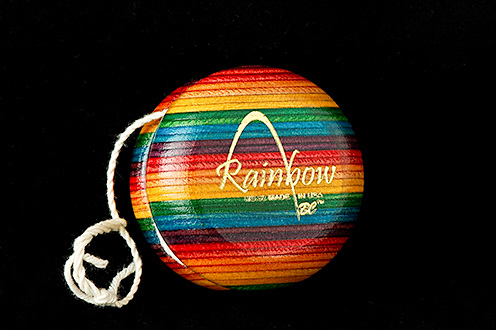 Considered by some to be the finest wooden Yo-Yo made. Made of laminated and glued strips of multi-colored wood. The laminated wood is denser and heavier than the standard maple releases, resulting in a very smooth and solid spin. The Apollo Pro is one of the most popular of BC's wooden yo-yos. Laminated wood in a concave shape, for long spins. The model has been in production since nearly the beginning of BC. Many laminated woods have been used to make the Apollo, and BC changes the logos frequently as well. Note the model number, number 28. 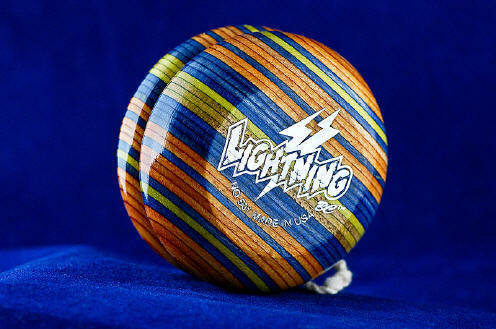 The Lightning is one of the primary models from BC. It's been around since the late 90s. Logos are frequently changed, and sometimes the type of laminated wood. A distant cousin of the Hummingbird Trickster. The Rainbow limited the colors that could be used, so the Lighting was created to add to the selection of laminated woods. The small print on the logo view reads "No. 504 Made in USA". 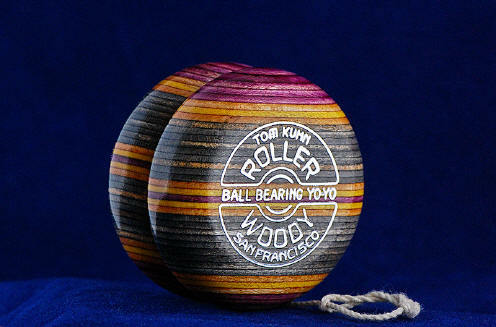 The Classic Roller Woody ball-bearing yo-yo with slightly heavier laminated maple. Reflective holo-foil logo stamp. This was originally designed without response which required double looping the string on the axle. Turbo disks are now supplied and a single string loop is recommended. I consider this the best wooden Yo-yo made today. 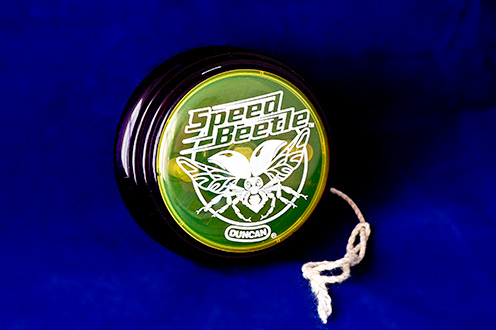 This Yo-Yo is currently (2009) doing the rounds on EBay and Quickie Mart checkout lines. The package says $ 4.95 but you can pick them up almost for free on eBay, not counting shipping. These are actually pretty good Yo-Yo's. The ball bearing axel and heavy weight make it an excellent spinner. 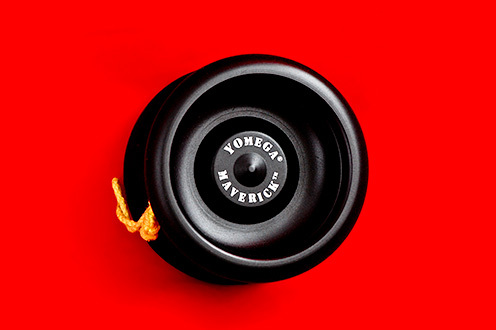 But being made in China, it is not part of the "made in America" Yo-Yo click and is not taken seriously. I bought a dozen of these things to give away to friends. It is called the "Broken Y" because there is a space half way down on both Y's in the word "Yo-yo". This is the harder to find version where Mr. Yo-yo is standing on a pedestal. Gold leaf stamped, the little G refers to the small G in Genuine. This was the classic standard line tournament sold during the late 40's and early 50's. Collectors refer to this as the "Classic Little G".